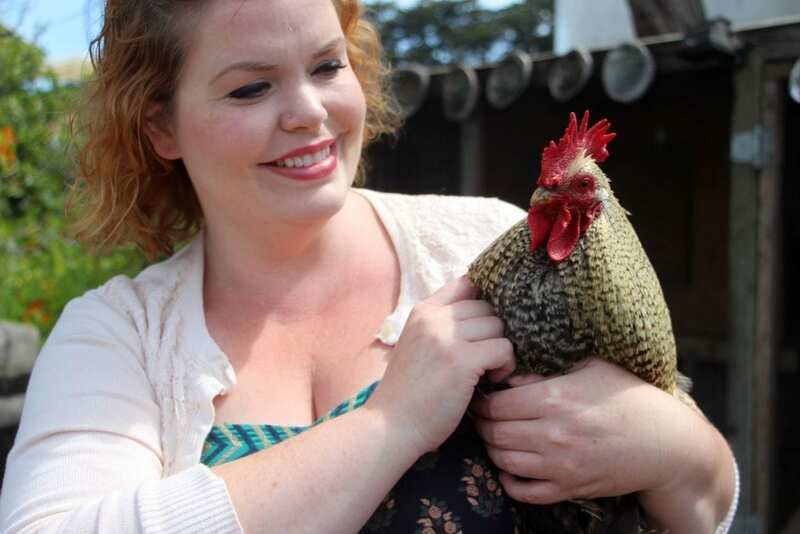 At night, when Christine Churchill carries her pet rooster Thumper into the innkeeper’s quarters of the Country Inn Bed & Breakfast, guests frequently joke with her. “Is that breakfast?” they ask. She now has a full brood of hens—Red Sexlink, Polish Crested, Ameraucana, Easter Eggers, Cuckoo Morans and super soft Silkies with funny tufts of feathers crowning their heads—all housed in chicken coops decorated with abalone shells. The chickens provide entertainment for the guests and fresh eggs for breakfast. Thumper, however, was the odd man out. But by the time Churchill discovered he was a rooster, she was already too attached. His 4:00 a.m. crow would be an unwelcome wake-up call for her guests, so she used her background in music and a sprinkle of ingenuity to build a soundproof roost for her beloved pet. Now each evening, Churchill carries Thumper inside, they watch a little T.V. together, and then he settles into his soundproof box where he can crow his head off without waking anybody up. Churchill is a city girl from the Bay Area with strawberry-blonde curls, dark eyeliner, bright red lipstick, and retro floral-print dresses that flatter her curves. The former high school music and drama teacher looks as though she might have just stepped off the set of Mad Men… not the chicken-cradling, whisk-wielding, small-town innkeeper she’s become. But it’s a role she plays well. And the changes she’s made to the inn since purchasing it in 2012 are part of a rising force that’s helping to redefine Fort Bragg’s identity following the closure of the town’s lumber mill. There was a time when lumber mills straddled every river mouth on the Mendocino Coast, cutting redwood trunks into milled boards and loading them onto ships bound for San Francisco. Founded in 1885, Fort Bragg’s lumber mill supplied steady employment for generations of workers—even as other coastal mills closed over time. But in 2002, the mill, which had once employed 2,000 people and served as the town timekeeper with its reliable clockwork of shift-change whistles, met a similar demise. A long, solitary whistle signaled the final log. When I last visited Fort Bragg a decade ago, the mill’s whirring saw blades and piercing whistles had already been silent for three years. For this blue-collar town of 7,000 with deep roots in the lumber industry, the closure of the mill was devastating. A number of storefronts lining downtown were shuttered. The 400-plus-acre oceanfront lumber mill site sat in ghostly ruins: a bleak landscape of rusting rail cars and abandoned buildings with broken windows and peeling paint. The beautiful coastal bluffs lining the former mill site stood far out of reach, fenced-off from the public. But when I visited again on a bright sunny day in June, change seemed to brewing. I noticed new shops, galleries, and restaurants had sprung up in downtown. A First Friday Art Walk showcases the work of local artists. The North Coast Brewing Company Tap Room now hosts touring jazz musicians on Friday and Saturday nights for its “Jazz at the Sequoia Room” series. Young new owners of an old local watering hole and landmark, the Golden West Saloon, had recently restored and reopened the bar, where they serve great cocktails with an authentic, old logging-town vibe. 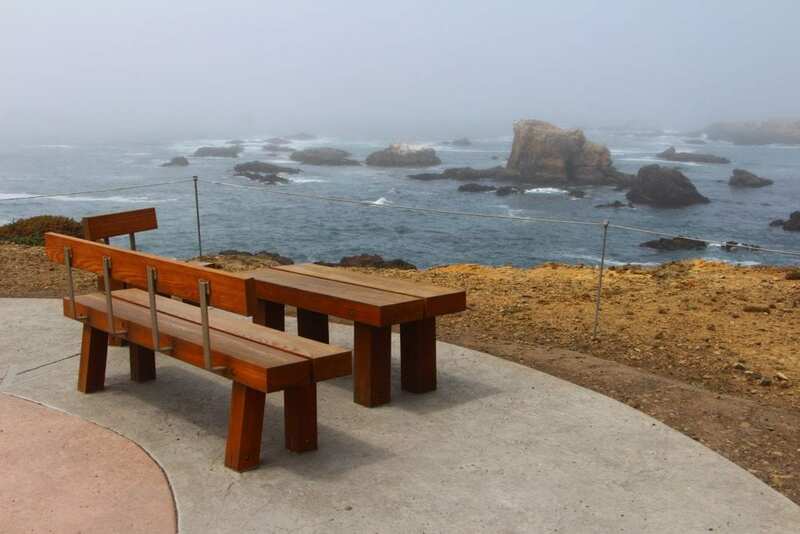 In addition to the new eight-foot wide paved trail, the City of Fort Bragg has also built wooden benches, installed interpretative signage, built a restroom and parking lot at the trailhead near Glass Beach, and begun restoration of the natural habitats along the bluffs. 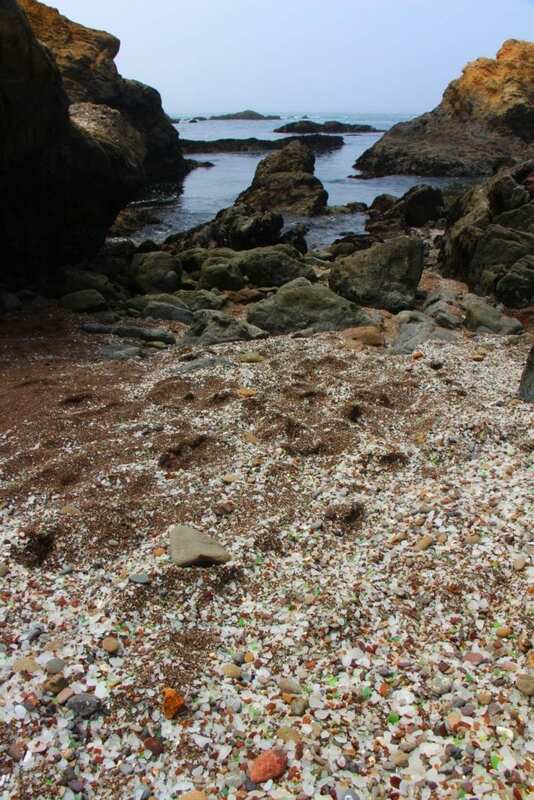 The northern segment of the Coastal Trail extends from Glass Beach to the north side of Soldier Bay. 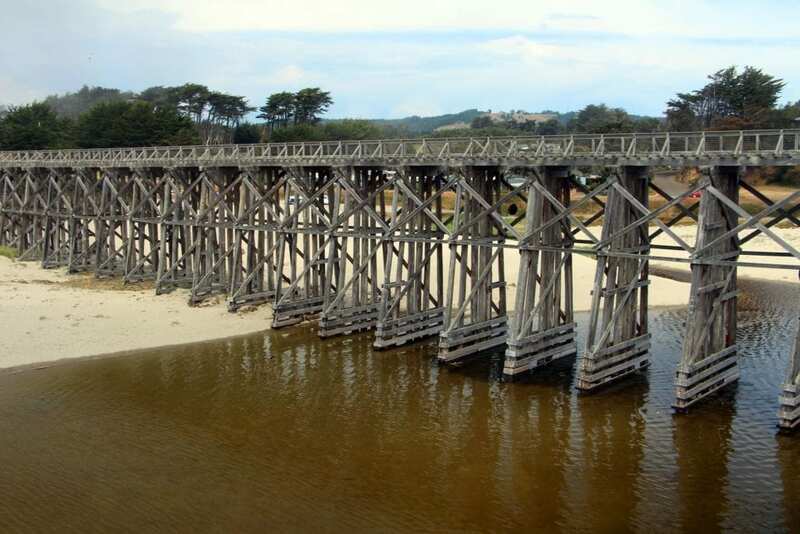 This segment also connects with a trail extending north from Elm Street along Old Haul Road to the picturesque Pudding Creek Trestle and MacKerricher State Park. A southern segment of the Coastal Trail, which begins at Noyo Point Road at the mouth of the harbor and extends to the south side of Soldier Bay, is due to be completed later this year. Completion of a central portion connecting the two trails is pending remediation of hazardous substances on the old mill site, but is expected to be finished in 2017 or 2018. 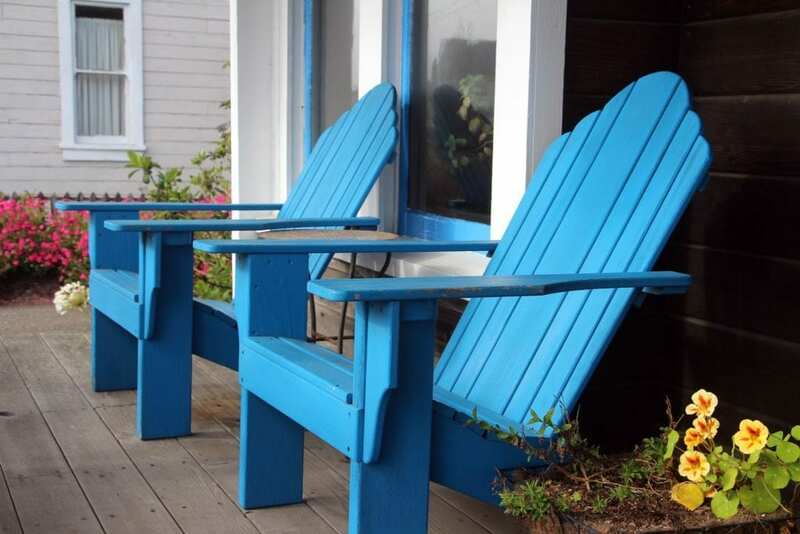 The new trailhead at Glass Beach is just four blocks from the Country Inn Bed & Breakfast. Churchill pointed the way from the front porch of the inn while holding a baby bantam chicken. The inn’s close proximity to attractions like Glass Beach was a large part of the appeal when Churchill and mother Kathleen purchased the inn three years ago. As Bay Area residents, they had always vacationed in Mendocino County. Then as Churchill’s mother was approaching retirement, they kicked around the notion buying a house on the north coast. They drove up to look at real estate, stayed at a B&B, and later joked in front of the realtor about wanting to buy a B&B of their own. He took them far more seriously than they intended and showed them the Country Inn Bed & Breakfast. 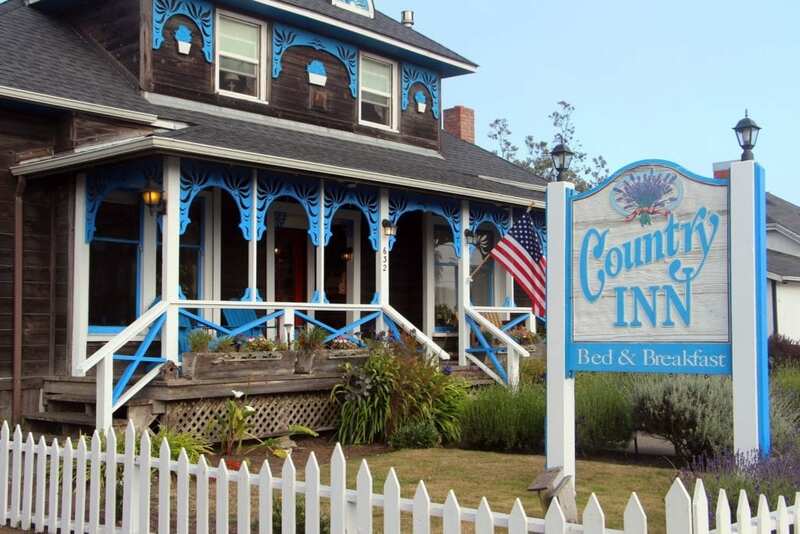 The 1890s vintage inn, built with virgin redwood timbers, had potential. It was located right on Highway One—the main drag running through town—and could easily attract drive-by traffic. It was just blocks from downtown shops and restaurants and many of Fort Bragg’s attractions including the Skunk Train, the Guest House Museum, and of course, Glass Beach and what would become the new Coastal Trail. 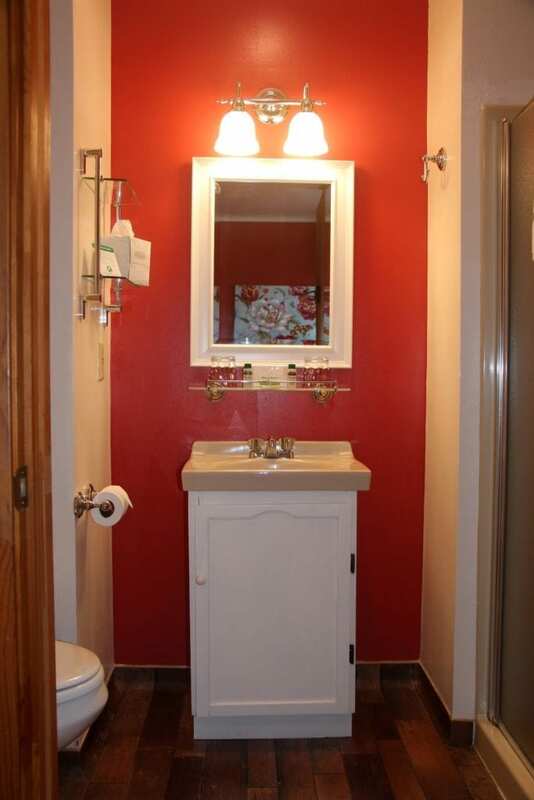 The work to date exudes good taste and modern comforts while remaining true to the era of the house. 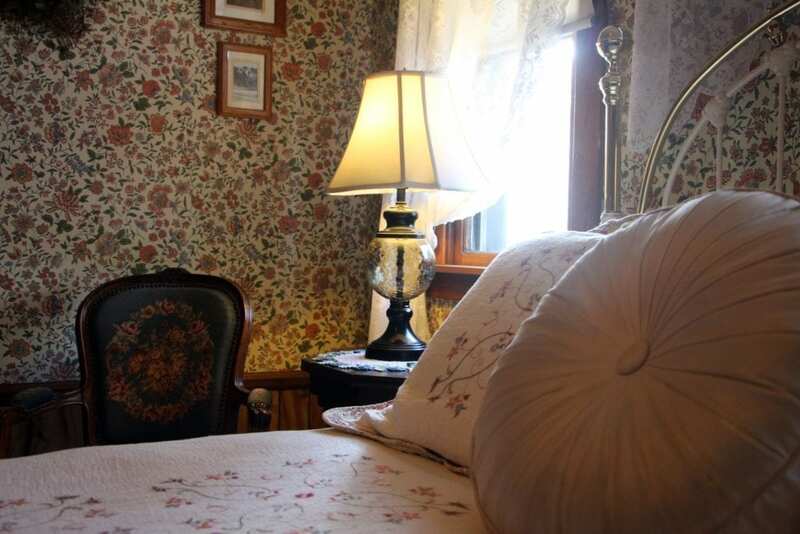 The seven guest rooms, all with private baths, feature fine antiques and period lighting without the bric-à-brac. The white enamel and brass beds are incredibly comfortable. The mattresses have Tempurpedic bed toppers, which are then triple-sheeted with smooth linens and down comforters and overlaid with finely embroidered quilts. My room, Autumn Song, had elegant lace curtains that floated in the breeze from the open windows and a wood burning fireplace with a fire log set to go with the light of a match. 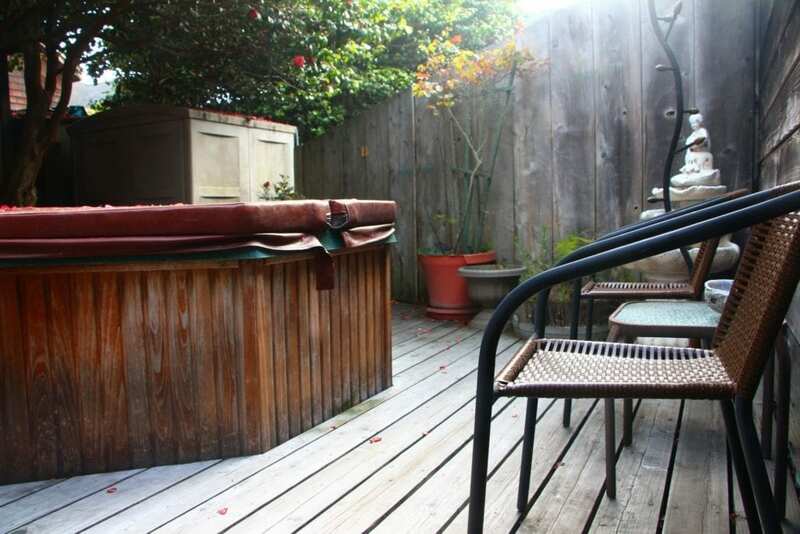 Tucked in a quiet corner on a private redwood deck, there’s an inviting hot tub for soaking beneath the stars and the glow of string lights hung from the camellia trees. 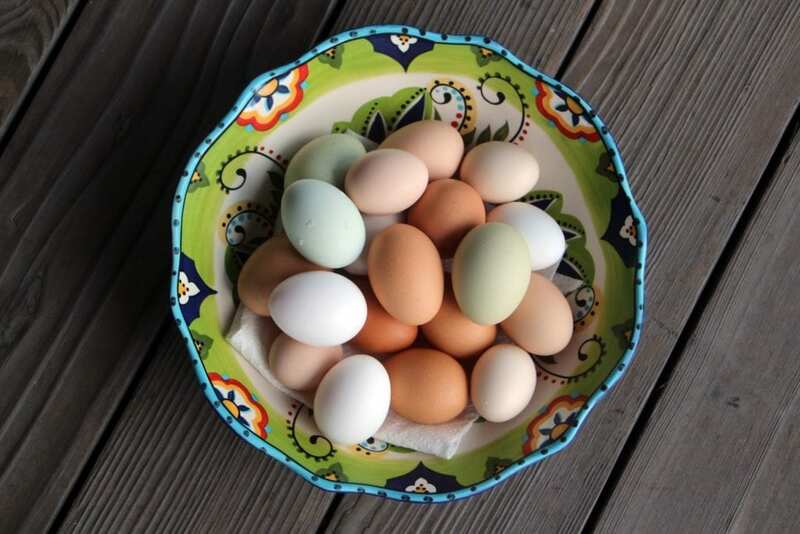 Breakfast and the hens’ fresh eggs are star attractions for the inn. The morning of my stay, Churchill made a hearty breakfast of eggs Florentine with roasted potatoes, sausage, fruit, and freshly-baked scones with her signature lemon curd. Other specialties include eggs Benedict, quiche Lorraine, huevos rancheros with jalapeno hush puppies, bananas foster French toast stuffed with mascarpone, roasted asparagus with poached eggs and a Meyer lemon hollandaise, and lemon ricotta pancakes with fresh strawberries and lemon curd. Gluten-free, dairy-free, vegetarian, vegan and other dietary restrictions are happily accommodated upon request. Breakfast is served at a communal table in two seatings: 8:15 or 9:15 a.m., or you can opt to have breakfast delivered to your room for a nominal charge. After breakfast, I walked the length of the newly-opened segment of the Coastal Trail, which curves gracefully atop the windswept ocean bluffs. The western views of rocky sea stacks and crashing surf are stunning and easily rival the beauty of anything else on the Mendocino coast. Reading the interpretative signage along the trail, I chuckled at the wryly-written descriptions of former mill site and the deranged “powder monkeys”—the men who worked with dynamite to build the area’s first railway tunnel for the mill. Standing at the ocean’s edge, I turned and looked east, back toward town across the vast grassy fields and the abandoned remains of the old mill. While the land is still privately owned and mired in battles over environmental clean-up, it seemed it’s only a matter of time before the wasteland between the edge of town and the coast will be redeveloped. Fort Bragg has finally reclaimed its coastline and the city seems poised for the next axe to fall. The momentum for redefining Fort Bragg is gaining ground.